He also denies the report on human rights abuses by the Inter-American Commission on Human Rights. He wants an "impartial commission" to come to the country to examine the human rights situation. I assume he has some Clinton-era lawyers in mind. The Venezuelan government will punish protesters because "all they want is to destabilize." The Honduran coup government punishes protesters because they are "putting many Hondurans out of work." "I would remind you that extremism in the defense of liberty is no vice." RAJ's most recent post reminds me that after two months, it is worthwhile covering some old ground again. Mel Zelaya sought to include a question in a national vote about whether Honduran voters wanted to form a commission to discuss the reform of the constitution. We know that a majority was against the idea, and so he certainly would have lost. Would you allow a president you believed was acting illegally to hold a vote he would lose, or choose to illegally overthrow him and remove him from the country? The Economic Commission for Latin American and the Caribbean just released its report, Latin America and the Caribbean in the World Economy, 2008-2009 (here is a PDF of the 14 page briefing paper). It's main argument is that Latin America should get closer economically to China. In the course of this decade, China has come to play a major role in production, international trade and FDI and has recently increased its international reserve holdings and the internationalization of its companies. For the region, especially for South America, recovery from the current crisis depends largely on sustained growth in the Chinese economy. The Latin American and Caribbean region has yet to fully assimilate the significance of Asia-Pacific, despite that region’s growing importance as a trade partner. Still less has any sort of coordinated strategy been developed among countries or groups of countries to forge closer trade and strategic investment links. Thus far, approaches by the Latin American countries have tended to be sporadic and isolated, and a number of bilateral trade agreements have been signed. Although these agreements are important, they are not enough to generate the scale and critical mass needed to encourage trade and technology partnerships between the two regions, nor to reduce the sharp asymmetry between the large volumes of trade and small levels of investment. In other words, China is here to stay, so let's make the relationship work better for us. “I’m ready to present my resignation,” he said in a brief telephone interview organized by aides. But then he got around to his conditions, many of which had a familiar ring to them because they had been proposed before and had failed to bridge the huge political divide that has left Mr. Micheletti and the man he helped oust from the presidency, Manuel Zelaya, both claiming to lead Honduras. It turns out his plan — which aides said would be sent Thursday to President Óscar Arias of Costa Rica, who is overseeing negotiations — is probably neither bold enough nor new enough to bring Honduras back together. The plan does not allow Zelaya to come back to the presidency, and as RAJ points out, does not offer amnesty from the various charges levied at Zelaya after the coup, all of which should be viewed with suspicion at the very least. This is the same thing I wrote about 10 days ago. Micheletti does his best to appear reasonable while rejecting the core of the San José Accord. Fortunately, it appears that strategy is not working as well as it once did. The State Department staff has recommended that Zelaya's ouster be officially labeled a "military coup," which carries with it significant aid cuts. It seems that Micheletti's latest refusal to negotiate was finally the straw that broke several camels' backs. This is purely speculation, but I have to wonder if the staff was fearful that the decision would get railroaded once pro-Micheletti lobbyists got wind of it. After this public declaration of State Department unity behind the decision, the administration cannot back out on it without looking foolish. I've had numerous posts about the lack of Latin American action with regard to Honduras. Lots of talk but not much else. Now I am glad to see something more concrete: AP reports that the Central American Bank for Economic Integration has provisionally frozen credits. The Obama administration is obviously moving at a snail's pace (as per the latest press conference call) but hopefully the combination of multilateral measures will keep the pressure on. SENIOR STATE DEPARTMENT OFFICIAL ONE: I think what I’m trying to say is that we really think that both sides need to accept the plan. And we will consider – we will continue to try to work with both sides that they will reach that same conclusion, and we will do what we think we can to help them move in that direction. But the current visa denial will not have much impact. QUESTION: Yeah, but I guess most businessmen would probably have multiple entry visas, which I assume would not be affected by this. SENIOR STATE DEPARTMENT OFFICIAL TWO: That’s correct. QUESTION: So we’re talking basically about tourist season, so about 45 – or rather, 30,000 tourist visas a year that you’re talking about. That doesn’t seem very – like a big deal. SENIOR STATE DEPARTMENT OFFICIAL ONE: What we have said is that we are temporarily suspending services because we want to do a review. We’re waiting for our lawyers to help us to understand what we’re supposed to understand. To the surprise of exactly no one, the coup government in Honduras told the OAS delegation that it would not accept the San José Accord. Seemingly in response, the U.S. government announced its embassy would stop issuing visas. Although Latin American countries have shown they will not take action against the coup government, hopefully their efforts help spur the Obama administration to do something. Micheletti met with the OAS, then blustered on about how only an invasion would take him out. By contrast, Zelaya has accepted the San José Accord (a point reiterated by his wife in the most recent meetings). Therefore, perhaps even failed meetings serve to remind everyone that the coup government is lying when it says it is open to negotiation. OAS: Follow the Arias Accord. OAS: OK, we'll leave. And then do this again in a few weeks. So the essential question is whether the OAS delegates bring anything new to the table. What pressures are member governments willing to exert on the coup government? Hugo Restall at the Wall Street Journal has a very interesting article on the growth of Chinese investment in Latin America. It gets straight to the pragmatic interests involved, which I agree is the best way to understand China's role in the region. There are several reasons to be relatively sanguine about China's increasing involvement in Latin America. Most obviously, the Chinese interest in the region is pragmatic rather than ideological. The goal is to further economic growth at home by opening new markets and guaranteeing a supply of necessary inputs. Rocking the boat politically is not on the agenda. Even where Beijing is engaging America's foes, like Venezuela's President Hugo Chávez, it is careful not to offer encouragement for their destabilizing activities. The more China invests, moreover, the greater the risk of an eventual backlash. Already there are murmurings from vested interests in Latin countries that Beijing is a neocolonial power, buying raw materials and flooding the region with its cheap manufactured goods. Certainly competition from Chinese goods has had a much greater effect in Latin America than in the U.S., hurting the textile industries in Brazil, Argentina and Mexico. This has brought a wave of antidumping suits. For all the talk of budding South-South relations, the reality is that developing economies directly compete with each other because their comparative advantages are similar. Fidel Castro is now wearing a regular shirt rather than an Adidas track suit, which has been his thing for three years. He may in fact not actually be dead. The Honduran Supreme Court issued a nine-point statement about the San José Accord, the most important of which is the assertion that Zelaya cannot have an amnesty. It is a rather surreal read, as it emphasizes the need for rule of law and respect for the constitution, without acknowledging that illegal and unconstitutional acts are what brought the ire of the international community in the first place. Now, the court is essentially arguing for the status quo ante, while pretending that forced removal from office, exile, human rights abuses, etc., etc. after June 28 never happened. Update: the indispensable RAJ has detailed discussion and translation. Particularly in the South, where the Latino population is still growing very quickly (though not as much as before, since the base population is now much larger) companies are well advised to capture as much of the market as possible. This is one of the beauties of capitalism--there is heated (sometimes vitriolic) debate about immigration, but if there is demand, companies will work to provide the supply. Companies are also coming to understand demographic realities. The Latino population is here to stay, and they need to pinpoint the needs of young families. I thought of this today because of an email I just received from Food Lion, a chain of supermarkets in the southeast and mid-Atlantic. Within the retail and supermarket industries, Food Lion, LLC is well known for its support of Diversity and Inclusion at every associate level, while at the same time paving the way for Great Customer Experiences through our historically low prices. With this spirit in mind, we invite you to participate in the “re-grand opening” of one of 54 Food Lion supermarkets that has been remodeled specifically to meet the needs of our ever growing Hispanic Community. In these Supermarkets you will find typical Hispanic products that originally come from Latin America and are offered at our everyday low prices. Come and experience the changes in our Produce Department; tour our Meat Department and see the special cuts and the variety of meats and chicken we offer; visit our Fish & Seafood Department; look at our Frozen Food Section, and last but not least feast your eyes on our wide selection of Hispanic Grocery Products that will delight you. Also, during the “re-grand opening” you will have an opportunity to review our extensive selection of Food Lion’s private label offerings, enjoy sampling, have the chance to win a Food Lion gift card worth $20, tour our store and partake of the ribbon cutting ceremony. At these stores we will continue to offer the great services, including check cashing facilities and wire transfers through Western Union, our customers have come to expect. Please join us in celebrating this important occasion for Food Lion and the Hispanic community in Charlotte. Once again, we would be honored with your presence at our re-grand opening, and enjoy the best Hispanic products at great prices. In his book Soft Power, Joseph Nye had argued for the U.S. government to expend more resources on media, foreign exchanges, and other means of cultural interchange. Coincidentally, Samuel Logan at Security in Latin America notes how this is taking place. Except that it is Iran. The Iranian administration caused an uproar in the government’s own Majlis parliament when it provided Bolivia with an unapproved loan of over 280 million dollars on July 31, 2009.Over and above the material and financial support that Iran has provided, newly installed TV and radio stations may spread Tehran’s influence at a more cultural level. Iranian radio has broadcast in-depth reports and interviews about its positive relationship to Latin America, the evils of colonialism, and anti-imperialism. “This opportunity has come up for Iran,” said Dr Massah, a university lecturer on one program, “to spread the slogans of anti colonialism, prevent the international system from becoming monopolized, and spread the sense of seeking justice, which arises from Islamic standards, in [Latin America].” Bolivia’s state-run TV channel regularly shows Iranian movies, and a Muslim preacher delivered services at a state-sponsored event in June 2009. Interesting stuff. I have to wonder, though, how much traction Iranian TV and radio will get in Bolivia, and whether that would foster greater sympathy for Iranian foreign policy. I had previously written about Mel Zelaya's newly established travel pattern for Mexico, Brazil, and Chile. Yesterday he repeated it in Peru. He met for an hour with Alan García, who said he supported the Arias plan but offered no more than that. Then Zelaya criticized the U.S. for not doing more. Then he left. Wash, rinse, repeat. That is Eduardo Frei's new slogan. It is about as non-catchy as you can get. Better than what? Than all the previous years of Concertación governments, which included your own? Frei needs help. A recent CERC poll has Sebastián Piñera at 37 percent, Frei at 22.3, and Enríquez-Ominami at 14.6. But there are still over three months to go. It is the ability to get what you want through attraction rather than coercion or payment. It arises from the attractiveness of a country's culture, political ideals, and policies (p. x). The idea is quite interesting. But the analysis is, well, soft. He argues that soft power rests on three resources: "its culture (in places where it is attractive to others), its political values (when it lives up to them at home and abroad) and its foreign policies (when they are seen as legitimate and having moral authority)" (p. 11). This certainly describes the problems the U.S. has had in Latin America in recent years, where for example the message of democracy is combined with policies that have serve to undermine it. It is also problematic, as Nye himself notes, that the U.S. pushes free trade in places like Latin America while maintaining agricultural subsidies. But beyond that simple argument, Nye never lays out how these three variables interact, and what outcomes we should expect as a result. Instead, he offers fairly generic assertions like "To the extent that official policies at home and abroad are consistent with democracy, human rights, openness, and respect for the opinions of others, America will benefit from the trends of this global information age" (p. 32). Or that Yao Ming "could become another Michael Jordan" (p. 88) and this could mean something, though I never quite understood what. The overall policy message is that the U.S. government needs to keep soft power in mind when dealing with other countries and not to pretend it doesn't matter. Nye's analysis is bland but that message bears repeating. In the case of Latin America, the current U.S. response in Honduras may well be squandering the small reserves of goodwill President Obama had generated. Soft power cannot be created quickly, but it can be negated easily. In Latin America, the U.S. government tends not to understand (or care much about) that. Amnesty International released a report on human rights abuses in Honduras, based on a visit from July 28-August 1. This will be hard for the coup government to spin, though of course governments of all political stripes tend to argue human rights reports are politicized (either by leftists or imperialists, whichever you disagree with). Amnesty International is concerned that those wishing to participate in peaceful protests against the de facto government risk being physically attacked or being arbitrarily detained. Amnesty International is also concerned that female protestors are particularly vulnerable and that some women and girls taking part in the demonstrations are reportedly suffering gender based violence and abuse at the hands of police officers. Amnesty International is further concerned at the threats and physical attacks carried out by police and military personnel against media workers who are legitimately carrying out their important work covering events in Honduras. Intimidation of human rights defenders, increased restrictions on the ability of human rights defenders to move freely around the country and the erratic imposition of curfews are frustrating the capacity of civil society to monitor human rights violations across the country and limiting the essential and legitimate work of human rights defenders. Roberto Micheletti says that he has prayed to God not to allow bloodshed in Honduras. Meanwhile, he has been giving the orders that led to the bloodshed Amnesty International describes. When we discuss the legitimacy of a government or the legitimacy of a political role for the military, we are largely concerned with what the participant civilian political groups considered appropriate political processes, given all the circumstances. My analysis indicates that the military was often felt to be the only available structure that could perform certain functions the participant elite felt had to be performed. Military performance of these functions--whether checking the executive or maintaining internal order--was thus granted some degree of legitimacy, even by many groups who on cultural grounds were deeply antimilitarist. Thus when the argue in the following chapters that civilian groups "sanctioned" military intervention at certain times, my point is not to argue that I think such action was morally legitimate, just, or correct, but rather to illustrate how deeply embedded such activity was in the political system itself. Alfred Stepan, The Military in Politics: Changing Patterns in Brazil (Princeton: Princeton University Press,1971): p. 66. One of the themes of the coup government is that it supports the Arias talks, but Mel Zelaya cannot return as president. Roberto Micheletti reiterated that in a press interview. This is a very good sleight of hand because it simultaneously supports and rejects the talks. Zelaya's return is the core of Arias' proposal, so Micheletti can appear publicly reasonable while ensuring that the negotiations never go anywhere. Otherwise the interview is a lot of bluster. Strangely enough, Micheletti joins Hugo Chávez in claiming that a U.S. action may lead to war (invasion from Nicaragua? Who knows) though at least Micheletti does not suggest buying Russian tanks in response. Anyone interested in U.S.-Latin American relations should definitely take a look at the National Security Archive website, which has posted declassified documents about cooperation between Brazil and the U.S. to destabilize the government of Salvador Allende. These were declassified as part of the State Department's Foreign Relations of the United States series, much of which is now online. 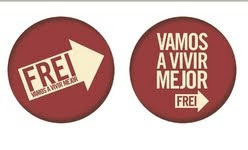 FRUS is a very cool resource--I was introduced to it in a U.S.-Latin America class while doing my M.A., and plan to do the same when I teach a Latin American Studies graduate seminar next spring. Presidents Richard Nixon and Emilio Médici met in December 1971 (Allende assumed office in November 1971). When you hear a dictator say that his visit "had been far above anything he had expected" you pretty much understand the Nixon/Kissinger approach to anti-communist governments. Médici also clearly felt superior to his fellow Latin Americans: "He saw how much difficulty he had in dealing with and understanding the Spanish-American mentality" and figured it was even harder for Nixon. Regarding Chile more specifically, Médici assured Nixon that he had Brazilian officers working to cultivate Chileans to overthrow Allende, and was willing to disburse aid or money. Brazil is rarely mentioned in studies of the Chilean coup, so this is an interesting revelation. Someone needs to do some digging in Brazilian archives, just as Patrice McSherry did a lot of successful digging about Operation Condor for her book Predatory States. At the same time, however, Brazilian officials were no dummies, and noted that it seemed the Nixon administration wanted them to do the "dirty work" and this might have negative consequences for the Brazilian military. In news that seems not to have changed in weeks, the coup government will send officials to Washington to do some lobbying, talk nicely while obstructing, and mostly kill some time. Meanwhile, the OAS continues its proactive policy of inaction, as apparently its new delegation visit "is now expected in the coming weeks." People are accumulating a lot of frequent flyer miles, but not much else. I know there are political and economic crises throughout the region, but what could be more important than alien visitation? So stop the presses, because there has been a UFO sighting in Tacna, Peru. Apparently there have been some alien abductions in Uruguay as well. If they really wanted to help out, maybe they could just abduct Roberto Micheletti. I recommend Tim Padgett's piece "President Obama's Latin Challenge" in Time, which concisely sums up the U.S. response to the Honduran situation. that Latin America now expects action to back it up. superpower leadership to put the squeeze on rogues like the Honduran coupsters. clout to resolve the standoff. On the latter point, however, I would add that Latin American political actors have barely tried. Unified clout could have an effect, but after the first week or so no one bothered to try anymore. For the past week or so, the pattern has been the following: meet with Latin American president, hear platitudes (but no promise of concrete action) from that president, then ask the U.S. to do something. It's been that way for Mexico, Brazil, and Chile. Some time ago I mentioned the splits in the Catholic Church in Honduras at the local and national levels. Thanks to a reader for pointing me to stories about Fausto Milla, a Catholic priest (from Santa Rosa de Copán) who in a public mass has called for insurrection (the link has some photos as well). This sort of grassroots effort helps explain why the protests have continued--and even grown larger--as time has gone on. Right now, the Obama administration seems content to let the clock run out, Latin American governments are not willing to act, and Oscar Arias has the H1N1 virus. Therefore, it may be the Honduran people who ultimately push (or don't push) the situation in one way or another. Following up on my post about Mary Anastasia O'Grady, here is a 2003 article justifying the 1973 Chilean coup. The military's bombing of La Moneda, the torture, and widespread murder were all "courageous." At least in that case she called it a coup. Fifteen members of Congress wrote a letter to President Obama (PDF here), asking him to formally label the coup a "military coup" and thereby suspend non-humanitarian aid, while also freezing the bank accounts and assets of those involved. The idea is that measures can be taken that will not adversely affect the Honduran people. It will likely be ignored, but it's good to have it on the record at least. José Miguel Insulza says an OAS delegation will go to Honduras by the end of next week, over seven days from now. If you're curious about the quality of the Honduran paper La Prensa, it is worth noting that one of their sources of information is Mary Anastasia O'Grady. In this particular case, they cited her rambling article about Honduras, the FARC, Mexico, Canada, Venezuela, and Communist parties. I certainly don't get the business model that informs the content of the Wall Street Journal's op-ed page. The rest of the newspaper is an excellent news source, with reportage that is often of very high quality. The editorial page, by contrast, is often a parody of right-wing lunacy: the last refuge of discredited neoconservatives, supply-siders, and other extremists. Do the Journal's editors really think democracy is best served by offering the public such a one-sided diet of opinion? Do they feel no responsibility to offer a wider range of views to their readers, as the rival Financial Times does? More importantly, wouldn't their market share (and profits) be increased if they offered a more diverse range of views? President Obama announced that immigration reform would have to wait until next year. This is not particularly surprising, given everything he's trying to do at once. It had been a matter of speculation for some time, with Harry Reid giving positive signals along with Rahm Emanuel. But a common conclusion had been that Sonia Sotomayor's confirmation would give the administration breathing room. The administration could postpone immigration reform without bringing serious criticism from Latino leaders. The fact that Obama's announcement comes two days after she was sworn in gives more credence to that conclusion. It's not known whether the OAS will accept the terms for the visit. The meeting had been planned for Tuesday, but a new date has yet to be announced. You stall a few days here, and a few days there, and it starts to add up. Since he needs U.S. help to be reinstated, it is not a great idea for Mel Zelaya to ask UNASUR to formally criticize the expanded military agreement with Colombia. This comes just after he made a joke about Mexican politics. It has proven very hard to get any country to commit more than words to Zelaya's return, and so he needs to avoid giving anyone more justification for doing nothing. Liz Harper at Americas Quarterly quotes a "senior Republican aide" who wants to make clear that the party is not united behind Jim DeMint's position on Honduras, which is synonymous with the coup government's position. This is curious, because 100 percent of the administration's comments on the matter have centered on the fact that the negotiations must be slow and deliberate. Or perhaps "swift" has been redefined to mean "after November 29." Mexican President Felipe Calderón is obviously no ideological match with Mel Zelaya, but he made a point of giving him an official state welcome when he came to Mexico. Zelaya cannot afford to alienate anybody, so it was not a good idea to joke about Andrés Manuel López Obrador ("Sometimes it is better to feel like the president than to be the president"). Like elsewhere in Latin American, the Mexican government is not particularly interested in exerting any leverage over the coup government, so any gaffe just provides more justification for inaction. Roberto Micheletti says the Latin American delegation from the OAS can come to Honduras if they want, but he will not allow Zelaya's return. He knows full well that no Latin American country has shown itself willing to back up OAS demands, so all Latin American diplomats can be safely ignored. There are many reasons--strategic, ideological, etc.--that the Obama administration would decide not to impose sanctions on the coup government. We may disagree with those reasons, but we can understand them. However, the following is really just an insult to everyone's intelligence. The State Department is now saying that the administration has not labeled the crisis a "military coup" because after about six weeks they still can't figure out the legal issues involved. Yes, things take time. Like until November? As I've noted before, the Obama administration is being criticized from all sides for its reaction to the Honduran coup. News that the administration will neither insist on Zelaya's return nor use economic sanctions is troubling, to say the least. However, this also highlights the fact that not nearly enough attention has been paid to the anemic Latin American reaction, which has been characterized by an almost total refusal to go beyond rhetoric. Instead, Latin America talks, sits, and waits for the U.S. to solve the crisis. The Arias talks came about precisely because of Latin American failure. The only way to compel the coup government to accept Zelaya's return is to use leverage. Some of this will come from within due to strikes and protests, but the bulk will likely come from international actors who agree to take measures against the government. That includes Latin America. José Miguel Insulza was very effective in quickly getting hemispheric consensus condemning Zelaya's overthrow, but failed completely in terms of going beyond statements and convincing Latin American governments to use whatever leverage they have. He went to Honduras, demanded action, and was ignored. As a result, before long he became a peripheral figure. If the mission he is organizing now is to succeed, the diplomats involved must demonstrate that Latin American governments are willing to put the heat on Micheletti. Thus far, they have not done so in any consistent (and certainly not collective) manner. Fellow Central American countries do have some important leverage because of trade, perhaps the most leverage of any other Latin American countries. They halted trade for 48 hours after the coup, but then decided it was too painful for themselves. No one has said a word about a similar measure since. Venezuela cut off oil supplies, which is a useful measure, and hurts because Honduras was getting it at preferential prices. The problem is that Zelaya himself notes that Honduras gets only 15 percent of its oil from Venezuela. The rest comes from the United States. Now, Zelaya just visited Mexico, where Felipe Calderón treated him as a head of state, an important symbolic gesture. But Calderón promised only vaguely to help more "intensely." I hope that means something concrete, but thus far Mexico has done nothing. And where is Brazil? Lula has promised to intensify pressure on the coup government, but I am not aware of anything specific. Zelaya has indicated he will visit Brazil, so we will see whether Lula takes any action. I am disappointed at seeing so much passivity. Even Hugo Chávez was left saying, "Do something. Obama, do something!" The big question is whether it is too late for Latin America to play a decisive role. The OAS is not being taken seriously after so many weeks of inaction, and if any international institution wants credibility, it has to go beyond talk. Can Insulza--indeed can anyone--do that? The Honduran military went on TV, making its best effort at spin. It was a valuable exercise, because now I understand that they were doing it all for me. For all of us here in the United States. Now I get it. Communism was on its way to my home, and so now I am feeling pretty relieved. Hugo Chávez likely also wants our precious bodily fluids. Perhaps I am missing something. I must be missing something. Early on in the crisis, José Miguel Insulza went to Tegucigalpa and demanded that Roberto Micheletti step down and let Mel Zelaya return to the presidency. Everyone said no. Now, five weeks into the crisis, he is going to send some diplomats to Tegucigalpa and demand that Micheletti step down and let Mel Zelaya return to the presidency. I must say I have never seen a military publicly complain about graffiti, but the Honduran military is so mad that it posted an article on its official Web site. It's not really about graffiti per se, of course, because the graffiti photos they show have anti-coup messages. They end the article with a statement that it is "worth mentioning" that it is an illegal act to spray paint an historical monument. Left unmentioned is their previous statement that if they enforce the law, there is no human rights abuse. Also left unmentioned is the basic fact that this is a matter for the police, not the armed forces. The coup government in Honduras has been censoring media and harassing journalists, and pro-government media there laments the fact that the Venezuelan government is censoring media and threatening to harass journalists who "manipulate the news with the purpose of transmitting a false perception of the facts." The Venezuelan news agency has lamented the fact that Zelaya's supporters were being targeted for censorship because they were not transmitting the coup government's view of the facts. The bottom line is their observation that in 2008 Honduran respondents had the highest ratio of "triply dissatisfied" versus "triply satisfied," on responses to three key aspects of political legitimacy: support for democracy, support for national institutions, and evaluation of the government's economic performance. They posit that this measure provides some warning signs. "Like the weather forecaster, we still cannot say with certainty whether there will be a tornado or precisely when the tornado will hit a particular barn, but we can say something about when the conditions are ripe for a tornado to drop out of the sky" (pp. 5-6). They provide a partial list, with the ratio of triply dissatisfied to triply satisfied. Further, here is a complete list of mean scores. 0 indicates triply satisfied, 1 indicates mixed, and 2 is triply dissatisfied. Once again, Honduras is at the top. * Mitchell A. Seligson and John A. Booth, "Predicting Coups? Democratic Vulnerabilities, the AmericasBarometer, and the 2009 Honduran Crisis." AmericasBarometer Insights: 2009 Special Report on Honduras.